The Superfun Times Vegan Holiday Cookbook by Isa Chandra Moskowitz is a giant tome with something for almost every holiday. While I spent a year making something from every chapter for each holiday, these days I just pick and choose what I want to make at any time of year! You can see what else I have made here. 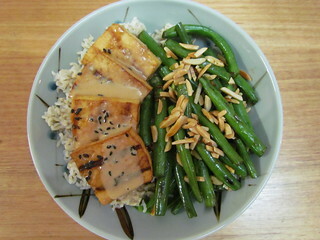 Grilled Tofu with Peanut Sauce (Fourth of July) and Seared Dragon Green Beans with Almonds (Chinese New Year): Tofu and peanut sauce, sign me up! This recipe is for two blocks of tofu, but I only used one. While I halved the tofu, I still made a full recipe of the peanut sauce, because of course. The tofu is dipped in a soy and sesame oil mix before grilling. I just did mine inside on the mini George Foreman grill in batches, and then popped in the oven at 120dC while I was making the rest. This kept it warm, and also helped it firm up a bit as I didn't press it first. I also didn't put it on skewers, because honestly I am not the biggest fan of eating from skewers. I served it over some rice, and with the seared green beans. Mixing my holidays together! The beans were super fast and easy to make, and really had a great seared flavour. I loved the toasted almonds, though I found the amount called for was too much for garnishing the amount of beans. The recipe calls for searing in coconut oil, gross, so I used peanut oil instead. 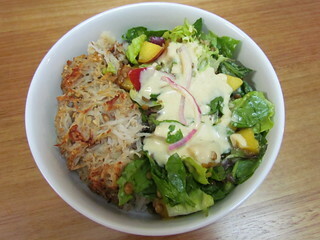 Tater Tot Kugel and Stone Fruit and Lentil Salad with Creamy Mustard Dressing (Rosh Hashanah & Yom Kippur): Disclaimer, there aren't any tater tots in the kugel, but it is meant to taste like a giant one. Honestly, it did not, but it was still very tasty! I made a half recipe, and got four side serves from it (it says a full one serves 10-12, presumably as part of a multiple dish meal). This is definitely best served piping hot from the oven! The salad was a lovely and refreshing side. Mixed greens, nectarines (you can use whatever is in season), lentils (I used a tin), with a lovely dressing and pickled onions. I only made a small amount on the onions, mostly because my mum likes them. Pickled onions don't sit well with my stomach. I was out of white wine vinegar for the dressing, so I used some diluted sherry vinegar, which worked well. 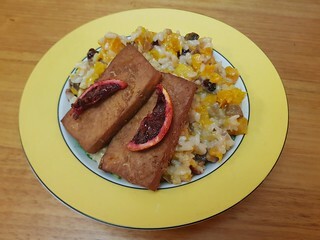 Blood Orange Glazed Tofu and Pumpkin and Cranberry Risotto with Chestnuts (Christmas): When winter gifts you a short season of blood oranges, you make this recipe. Again, this recipe is for two blocks of tofu. I halved the recipe again, as I am only cooking for three people. I used garlic powder in the marinade instead of fresh garlic, and the marinade also has blood orange juice, ginger, maple, and soy. I marinated it overnight, and the tofu absorbed most of it. The recipe says to bake at 190dC, but I know how tofu bakes in my oven so I increased the heat to 210dC to get it a bit firmer. The risotto was lovely, sweet, and creamy. It went well with the tofu. For the risotto, I used a 1kg package for chopped butternut pumpkin, rather than chopping 3 pounds of pumpkin (sore shoulders, tough vegetables, convenience appreciated). BBQ Nachos (Super Bowl): I don't watch sportsball, and this particular sportsball isn't even a thing over here, but that doesn't mean I don't enjoy watching what everyone eats for it. 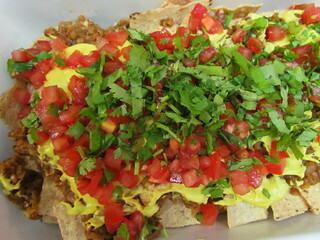 These BBQ nachos had layers of corn chips, a BBQ lentil meat mix, and queso, which you then repeat. Very important for optimal chip coverage! Then topped with pico de gallo, which I made without the raw onion or the jalapeno. I also left the jalapeno out of the queso, and used onion and garlic powder in place of garlic and onions. The lentils were meant to have some capsicum in it, which I also left out. And I used coriander for the final garnish rather than scallions. This made a huge casserole dish full of nachos, but really only served three or four as main meal. A great combination. 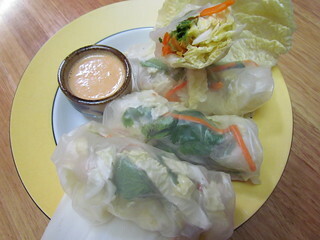 Rice Paper Rolls with Red Curry Peanut Sauce (Chinese New Year): Rice paper roll wrapping is an art, and while sometimes I have the skills, other times it just ends up looking sloppy, like these. I was not super keen on the filling either - cabbage, carrot, avocado, coriander, and mint, it was just a bit meh and not very filling. I really would have liked some tofu as well. The sauce was nice though, and added some much needed flavour. Though I only used 1 tsp of red curry paste instead of 1 TBS to make it Susan friendly. 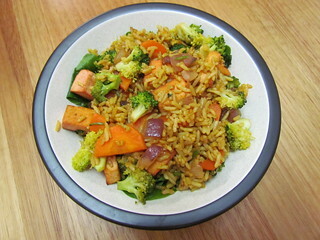 Curried Pork Fried Rice (Chinese New Year): This was the first recipe that I ever made from the book! I took the option of using tofu rather than seitan, because tofu is my true love. The tofu was soaked in some beetroot mix and liquid smoke to give it a pinkish appearance and smokey flavour. Mine didn't keep the pink colour too much. I also sauteed the tofu before I added it to the rice to give it some firmness. I used a large bag of microwave jasmine rice, which was 3 cups rather than 4 cups, but I prefer a higher stuff to rice ratio anyway. There was also broccoli, carrot, and red onion in it... I kind of would have liked a bit of pineapple as well. 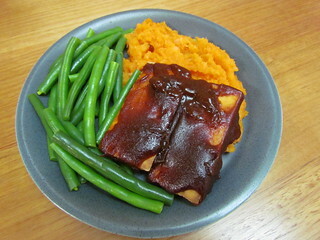 Tofu Short Ribs with Gingery Mashed Root Vegetables (Chinese New Year): Guys, this is super good! Again, a two block tofu recipe that I halved to work with one recipe. Though I still make a full amount of the mash. The sauce is hoisin based, with five spice, and is so amazing! The mash is a combination of parsnips, turnips, and sweet potato, and I used Nuttelex instead of coconut oil. I also served with some green beans. Recommend! These two little snuggle bugs! I have this book, but I've never made anything from it. So it's really nice to see what I'm missing! Of course, the picture I'd MOST like to jump into is the one of the two little kitties snuggling! I've made quite a bit from it, but there are so many recipes that I've barely scratched the surface. Oooh, everything looks great, especially all the tofu dishes! 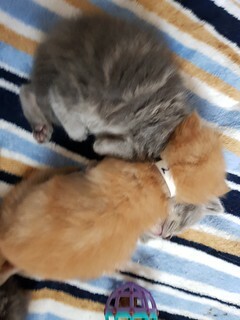 They are bigger babies now, but so cute with the snuggles. Tofu is my true love as well!! Along with potatoes! The BBQ nachos look and sound amazing! I do agree with Cadry though, I want to jump in with the babies!! Tofu and potatoes are life! I love that cookbook, too, though I don't own it--I just checked it out from the library a few times. I had that blood orange tofu for Thanksgiving, as well as a few other recipes from the book. The green bean casserole is AMAZING and even though I was only cooking for two I immediately regretted halving the recipe, so if you ever make that one, make the whole thing. SO GOOD. Good to know! I haven't made that here, and have only really made one or two green bean casserole recipes before as they aren't a thing here. But I have enjoyed the ones that I did make. So I will definitely make the whole one of this when I get around to it! It is so hot out here, too hot for me to actually go outside and use my BBQ. Instead I crank the air con and cook inside. Cooler months are my ideal BBQ time, as I can go outside without melting.